It is with great sadness that we announce the passing of Gregory Fong. A group of his students have founded the Portland Tai Chi Arts Association and continue to train and teach. Please check out our class offerings below. For more information, please contact Gary Wass at 509-240-6989. Classes are held at the CCBA at 315 NW Davis St Portland, 97209. Monday & Wednesday: 7:30 pm- 9:00 pm Randall Havas – Invitation only. 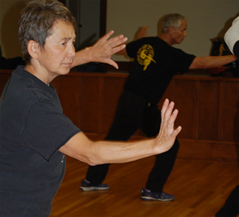 Tuesday & Thursday: 7:30 pm – 9:00 pm Basic elements of Tai Chi, Chen Form & weapons – Kathy Albert, Gary Wass.